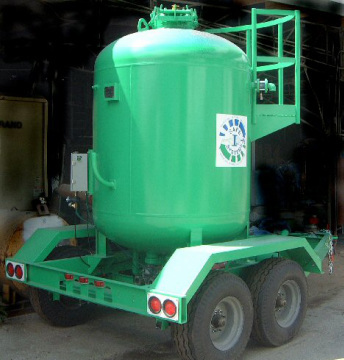 Safety and functionality are central to this trailer-mounted blast machine with a holding capacity of 6 tons of abrasive (100 lbs./ ft³). Its four (4) blast outlets are outfitted with the new SAFE Systems S4C metering/pinch valve. The operator gains a great deal of control over abrasive flow and shutoff with these new valves, as well as eliminating the inherent danger of pinch valves. Experience has shown that operators love these new S4C valves which allow adjustments to be made right at the control box. Contractors love them because abrasive consumption can be significantly reduced. ASME certified, the pressure vessel is rated at 150 PSI and protected from over-pressurization by a rupture disc. A large 16” hinged manway in the top of the vessel is fitted with a special pressure alert system to deter opening the pot while under pressure. A safety catwalk is provided for the operator to stand on while loading abrasive. The specially-designed, dual-axle trailer is highway legal with all required lighting, fenders, etc. and is equipped with hydraulic surge brakes and a pintle style hitch. The unit is available with either 12VDC or 120/24 VAC electrical control box and comes with electric Deadman switches. This equipment allows up to four (4) blasters to operate at one time, giving the contractor maximum production for his money. Capacity, 6 tons of abrasive (measured @ 100 lbs/ ft³). Not intended to be towed at highway speeds when the vessel is over ½ full of abrasive. Tow vehicle must be of sufficient size and weight to safely and legally tow the blast machine.